Finally one of our gulls has started his migration north. After a couple of false starts and hopes Gary set off from Portugal at 0239 on Thurs the 29th. He was just north of Avis when he decided to start heading home flying north east into Spain. 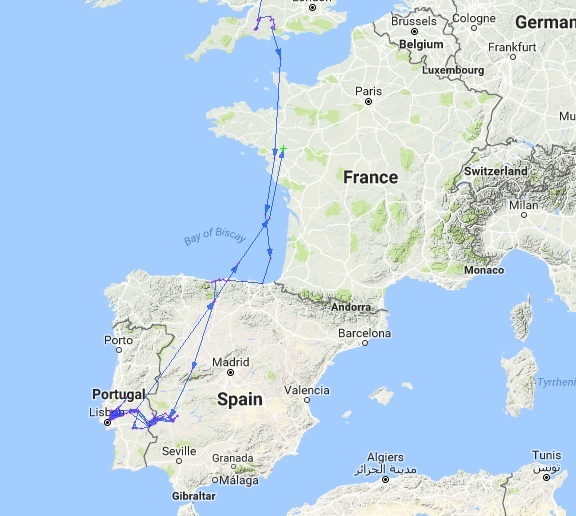 Four hours later at 0640 he was picked up at Aguilar de Campoo before heading over the Bay of Biscay where he was then picked up still flying at 0940 and 1241. His last update came in at 1540 where he was flying over Nantes in France. Go Gary Go! He’s covered half his migration route in 10 hours! When will he hit Greenock or will he stop off in his autumn haunt near Burton upon Trent? Will he follow the motorway north? We will keep you updated.